Trouble Funk hail from Washington, D.C., and are, perhaps, the prime purveyors of one of this country's most overlooked musical styles: go-go. Go-go began at the dawn of the 1980s, an opportune moment in musical history which straddled the apogee of disco and the burgeoning of rap. Indeed, Trouble Funk's breakthrough album, Drop the Bomb, was issued by the Sugar Hill label, home of The Sugar Hill Gang (whose "Rapper's Delight" is generally credited as the first rap hit). Trouble Funk's go-go sound is characterized by call-and-response interplay with the audience, as well as lots and lots of percussion (as critic John Leland has noted, "in no other North American music does the cowbell play such a major role"). Like earlier funk bands, Trouble Funk features several horn players, as well as scratchy rhythm guitar in the best tradition of Catfish Collins and Nile Rodgers. Additionally, since the music is made for dancing, the emphasis is on rhythm, rather than melody ; the horn and keyboard riffs re-emphasize the beat more than the tune (there are occasional exceptions when the band works in a more song-oriented mode). The rhythm differs a little bit from earlier funk because go-go, having come hot on the heels of disco, is able to draw (if only a bit) from that style's cultural cross-fertilization. Other than the heavy interaction with the audience, the vocal style is essentially identical to early rap. Therefore, the main difference between go-go and rap music seems to be that go-go employs a full band ; why go-go has not caught on as well as hip-hop has is quite puzzling. 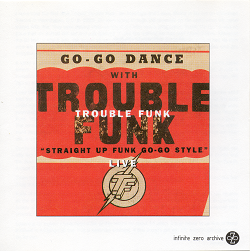 The go-go aesthetic works best in front of an enthusiastic audience, which is why Trouble Funk's live recordings are widely regarded as their most successful. On Live (which consists of concert recordings from 1981), the exuberant audience comes through loud and clear, and conveys the energetic mood so well that the party atmosphere itself is like another instrument. The result: this compact disc comes off as nothing less than a self-contained dance party; in fact Very Live may have been a more apt title. The continuous groove is broken up into four lengthy tracks, simply designated "Part A" through "Part D" in lieu of song titles, although the main riff of "Let's Get Hot" from Drop the Bomb shows up, as does that album's title track (in fact, it sounds like the same version was used on both albums). Update, March 2004: As of this writing, both Early Singles and Live have been re-issued as a double-CD package. ©1996, 1997, and 2004 by Joe Castleman.